Handbell Music MADE-IN-SINGAPORE, featuring Singaporean Composers/Arrangers. This handbell/handchime version, arranged by Singaporean percussion artiste/handbell director, Damien Lim, may be performed solely on handbells, and with/without percussion. Although its scored for 5 octaves of bells mixed with chimes, a bell choir may still perform this work with under 10-11 ringers, since the bass bells (C5 & below) may be managed by fewer ringers using the mallets on bells. This is a highly rhythmic piece, which promises to be a familiar hit, turned hip thumping & foot tapping for your ringers & audiences. Music arranged/transcribed for handbells with permission from (Publisher): Excelender Songs, Sony/ATV Rhythm, Dafons Songs, Sony/ATV Latin Music Publishing LLC, Los Cangris Inc. (Sub-publisher): Sony Music Publishing (Pte) Ltd, EMI Music Publishing Group Singapore Pte Ltd. When one lands in Singapore at the famous Changi International Airport, you will drive past the KATONG area, on your 17 minutes journey towards the city. "Tanjong" means beach / seaside and "Katong" is the name of an extinct species of turtle. Tanjong Katong is an area rich in the PERANAKAN CULTURE and an enclave for food from all over the world. A delightful area for all a multi-sensorial experience indeed. SMELL & TASTE the food, HEAR the sounds of multi-languages spoken here, SEE the colours and designs of the Peranakan housing & finally TOUCH the items in this area, including its goods, buildings and artifects. This score is written for both intermediate ensembles with either lack of instrumentation or manpower. The 3 octave version will produce an outcome that is rather lyrical and soothing to the ears and mind. The 5 octave version gives an "oomph" to the music since the bass bells adds in a groovy and rhythmical spirit to the song. Enjoy both versions, since it produces 2 different outcomes. Not many scores allows you to achieve this outcome. 3 & 5 Octaves (opt 7 Octaves) + optional Ethnic Percussion & Flute. This work is commissioned as the handbell work to represent Singapore & the Handbell Ringers of Singapore (HRSG) Guild at the 18th International Handbell Symposium in Cairns, Australia (6 - 11 August 2018). This song, written for handbells, telling the story of Singapore, from its humble beginnings, as a sleepy, swampy, seaside kampong (village), when the British arrived in 1819. Progress took place and they brought trade to Singapore. Immigrants started to come to make Singapore their home. Only to be interrupted by the WW2 in 1942-1945. After the war, progress took speed and Singapore developed exponentially under the foresighted leadership of PM Lee Kuan Yew. The faster paced 2nd half of the music describes development in the areas of trade, education, Defence, Health, environment, housing and foreign relations. And upon establishing multi- international relations with various countries, and Singapore soon became a first world nation, where its people live in harmony, regardless of language, race or religion. Singapore today, is a city-state-country, a nation described often as a melting pot of cultures, where people live together in peace and in harmony. True to the description of BUNGA SAYANG = MY LOVELY FLOWER. Singapore has bloomed. Music arranged for handbells with permission from Universal Music Publishing Group (2017). Handbells version originally published by Lim Yong Productions, 2009. 'It's Time for Sayang Sayang' was written and composed by Baba Alvin Oon in 2003 as a jingle for a radio commercial for Tangs (a Singapore department store) Christmas promotion 'A Very Peranakan Christmas'. 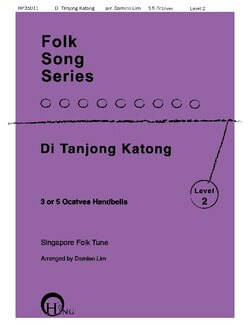 The song was first heard on Singapore's radio stations and also as the in-store theme song during the Yuletide season. ​The song's theme is about finding time in our hectic lives to love and care (sayang sayang) for family and friends and to appreciate life around us as we smell the roses along our journey. The full version of the song was first performed in the Peranakan musical 'Bibiks Go Broadway' also in 2003, produced by ShowFEST (a former event production company) and staged at the University Cultural Centre. The stage performance version was sung by Baba Ivan Heng. As part of the theatre production, a soundtrack CD album 'The Best of Peranakan Tunes' was produced and the song, sung by the composer himself, was featured as one of the tracks. In 2005, the song became the unofficial theme song for the Singapore Pavilion at World Expo 2005 Aichi, Japan. The song was used as part of the daily Singapore show and it became popular with the many Japanese visitors who started singing the song enthusiastically breaking the language barrier between performers and audience. In 2008, Singapore's TV station Mediacorp produced a sitcom series called 'Sayang Sayang' and the song, sung by Baba John Lee, was used as its theme song and then again for its second season in 2009. The tune was also used as a Mandarin song and performed by Taiwanese artiste Hebei from the popular group S.H.E. and featured in her solo album. The song was also produced in different music arrangements in music albums by The Main Wayang Company in 2008 (It's Time For Sayang Sayang) and 2011 (Baba Nyonya Newstalgia). This handbell version (arranged by Baba Damien Lim) was commissioned as the handbell work for the 2009 Asia Handbell Festival in Singapore, which was unfortunately called off due to the emergence of the H1N1 flu virus.